Martinelli Luce, maker of the iconic Cobra and La Ruspa lamps, is releasing Bandero; a sleek modern table lamp that will appeal to every purist. The ultra minimalist Bandero lamp was designed by the Belgian designers Serge & Robert Cornelissen for Martinelli Luce in Italy. Reduced to it's most essential elements, the Bandero table lamp displays beautifully on a library, console table, bedside table or when placed on an office table. 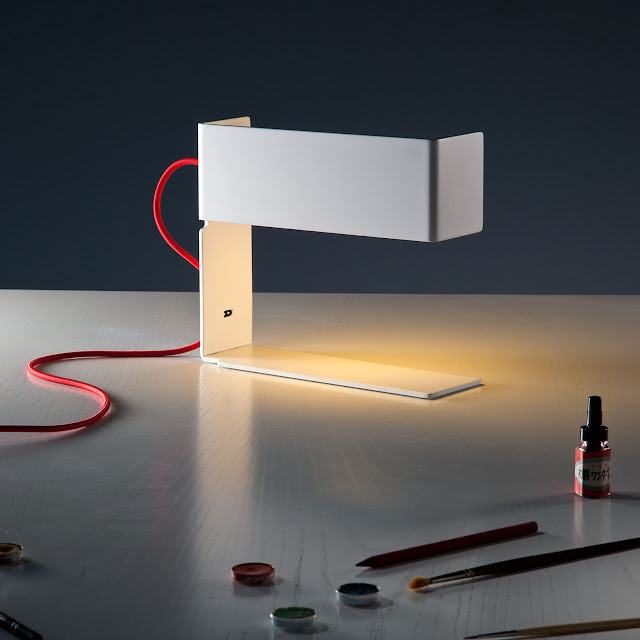 This table lamp encapsulates the approach of the Belgian designers to the design of simple and rigorous light fittings. The structure is made from a sheet of white lacquered aluminum that is folded to create a contemporary architectural lamp shade with clean rigid lines. The light source is cleverly concealed behind the metal shade. Bandero is a simple, sophisticated table lamp that highlights the clarity of its structure. The electrical cord is wrapped with red fabric which provides a perfect finishing touch. Bandero provides both directional- and diffused lighting. As featured in Domus.